Thanks to bookbumblings for hosting this awesome blog hop. 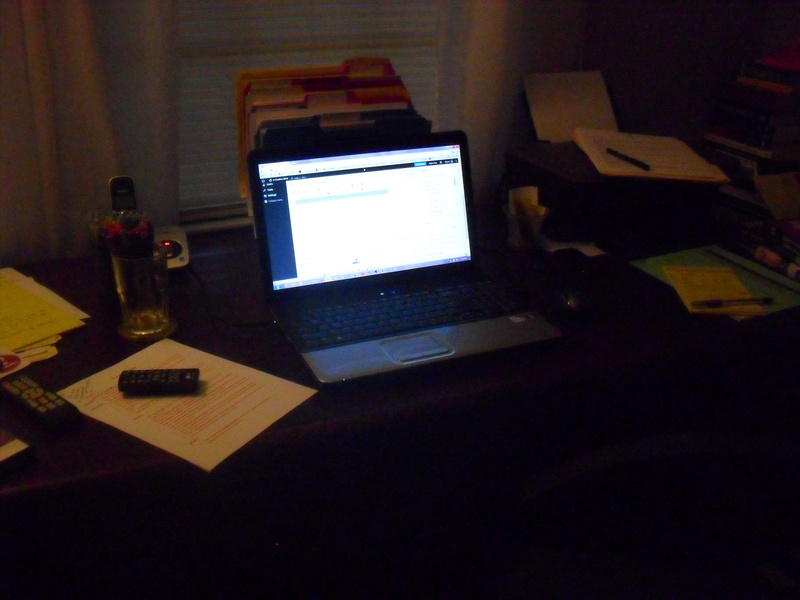 So, today’s post is about where I blog. This is where I blog. It’s my desk in my office. I usually don’t set up shop anywhere else in the house to try and get any work done because we have dogs and cats. They tend to want my time when I try to work in other parts of the house. I have a great view to look out at when I need a little distraction from working on the blog or writing my novels. Look forward to reading about your places to blog. I work from a laptop too. My cat is always trying to put his comments into the writing. I know what you mean. My cat when I do allow the animals in the room with me sits on the desk and swats at my fingers and tries to put comments in the writing. A desk blogger! I think I spend too much time at my desk! between FRG things, PTO things, bills, and college work – I just want to be comfy when I blog! So I tend to do it from my bed or couch!